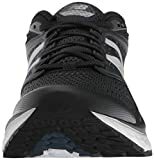 Interested in the New Balance Men's 1080v8 Fresh Foam Running Shoe, Black/White, 11.5 D US? Is the price too high? You can easily price watch this product and we'll notify you when the price reaches your target.